When I throw this question at my boyfriend, who is a law student and thus a “non-specilaist” of the Bible: “How does the underworld look?” The first word comes out of his mouth is “fire”! When I am in the Vatican, looking at the fresco of the Last Judgment by Michelangelo, at the right hand corner, at the bottom, I see that the boatman Charon shove the damned souls into the fiery hole. When I read John Milton’s Paradise Lost, I imagine Satan falling into the “bottomless perdition” filled with “penal fire”. When I go to church on Sunday, I listen to the Lukan story of the rich man and Lazarus, where the former thirsts for water in the eternal flame. Here comes one interesting fact: If we try to find a reference to fire in the “Sheol” (a uniquely Hebraic term to designate the abode of the dead) of the Hebrew Bible, we would be disappointed. Instead of with fire, the Hebrew Bible often associates “Sheol” with water (e.g. Job 26:5-6; Ezekiel 31:15; Psalm 69:2, 14). Where are all these images of fiery underworld coming from? I do not know the answer. 3. The “Wicked Bible” 1613: Omits an important “not” from Exodus 20:14, making the seventh commandment read “Thou shalt commit adultery.” The printers were fined 300 British pounds and most of the copies were recalled immediately. Only 11 copies are known to exist today. 6. The “Fools Bible” 1763: Psalm 14:1 reads “the fool hath said in his heart there is a God,” rather than “… there is no God.” The printers were fined 3, 000 pounds and all copies ordered destroyed. The display of the King James Bible in Weston Room. On display is the second (1613) edition of the King James Bible, sometimes known as the “Judas” Bible, owing to a misprint of “Judas” for “Jesus” in Matthew xxvi:36. 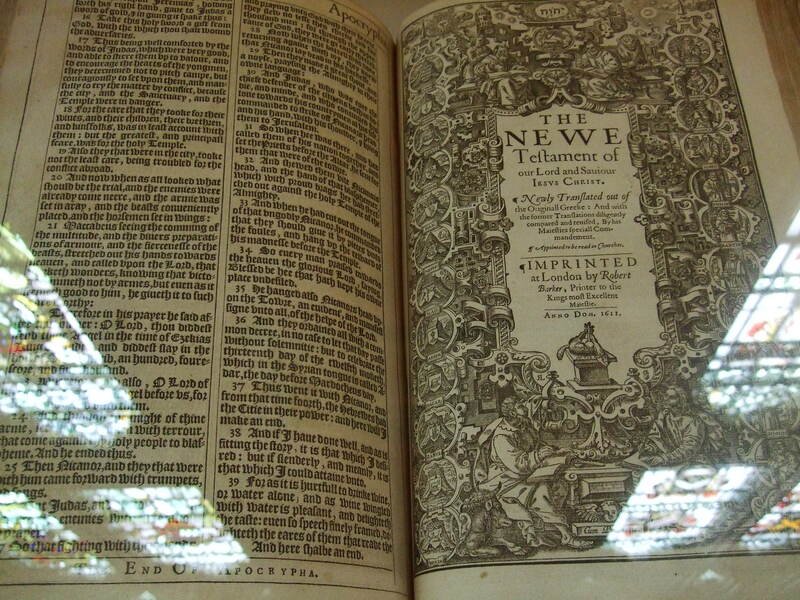 The New Testament title page, shown here, is dated 1611.